It’s not often that archivists get to visit the source of their historical records. Archivists at the Borthwick Institute for Archives got to do just that on a trip to former mental hospital, the Retreat, in York. 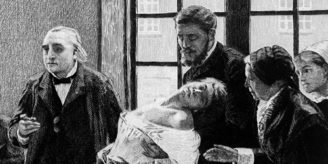 The Borthwick Institute is part of a partnership to digitise mental health archives, selected from across the UK, and make them freely available through the Wellcome Library catalogue. Digital archivist Jenny Mitcham gives us a taste of what’s to come from the Retreat archive. Arranging a tour of the grounds of the Retreat for a morning in January was a bit of a risk. We were truly at the mercy of the elements! We were fortunate however to have picked a day when there was no snow or ice on the ground and nothing falling from the sky. Saying that, this was one of the coldest weeks for a while and the temperatures only just peaked at a chilly one degree celsius as we were shown around the extensive grounds of the hospital. The north front of the Retreat near York. 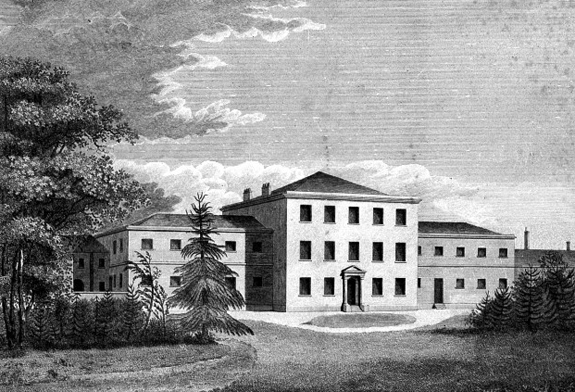 From Description of the Retreat by S. Tuke, published: 1813. Wellcome Library reference: EPB/C 52155/C. 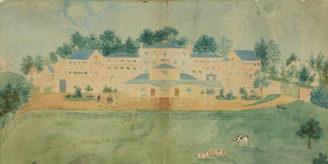 We have been lucky enough to receive funding from the Wellcome Library to digitise the archive of the Retreat (a psychiatric hospital that is situated right next to the University of York where the Borthwick Institute is based). We are several months into the project now and are in the process of delivering the third of 10 batches of digitised content to Wellcome for ingest and processing before inclusion in their library catalogue. Last week our in-house resident expert on the Retreat archive, Kath Webb took the project team around the grounds of the hospital and gave us a talk on its buildings, history and on some of the key figures involved with shaping the institution since it was opened in 1796. It really is a fascinating place and has a key position not only in the history of mental health care, but in Quaker history and the history of York. It was great to see the full extents of the grounds, and hear how the land and its buildings have evolved and developed over time. Lots has changed but there was also a surprising level of continuity. Landscape features and plantings that are visible on early plans and images of the Retreat and are now being re-established. Some of the ‘newer’ additions to the archive held at the Borthwick Institute are a set of large 20th century plans of the Retreat grounds, showing planting and marking positions of trees, and allied to these there are some Retreat ‘tree books’ noting trees and plantings – a rich source of information for the modern gardeners. 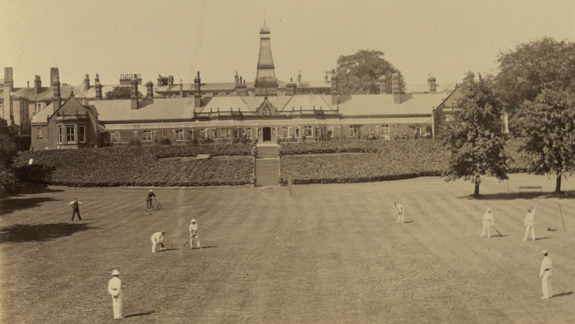 A cricket match in progress in the Retreat grounds in the early 20th century. Image credit: Borthwick Institute, reference RET 1/8/4/16/2. We were taken to the sports fields at the back of the Retreat and later in the day were shown old black and white photographs of the staff cricket and hockey teams that played there. We went into the burial ground where local Quakers and Retreat residents had been buried. Very simple headstones stood in rows, but recognisable names from the archives were all around us. 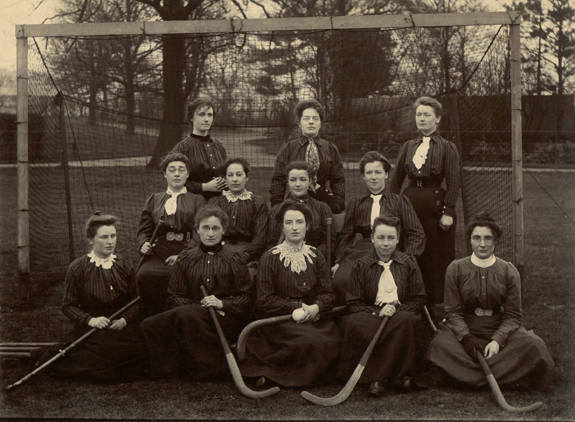 The women’s staff hockey team in 1902 in front of the sports pavillion in the grounds of the Retreat. Image credit: Borthwick Institute, reference RET 1/8/4/15/1. The project team are used to the cold (working as they do in an archive where we try and maintain temperatures that will cause the least stress to the documents within our care) however by the end of the tour we were starting to lose feeling in our fingers and toes and were glad to get back to the office and get the kettle on. It was great to have some time out to understand and appreciate the character of the Retreat and put the work we are all doing on this project into context. A version of this blog first appeared on the Borthwick Institute Blog.